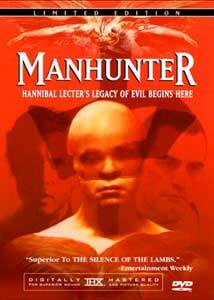 With the theatrical release of the hotly-anticipated Hannibal, Anthony Hopkins' reprise of his Oscar®-winning role as cannibal serial killer Hannibal Lecter, it was perhaps inevitable that the first screen appearance of the character, Michael Mann's Manhunter would be given a special edition release. However, the timing is unfortunate, because Anchor Bay's limited edition shows signs of being a rush job. Based on author Thomas Harris' book Red Dragon, this film concerns retired FBI profiler Will Graham (William Petersen), who captured Lecktor (as his name is unaccountably spelled in this film) three years before. Jack Crawford (Dennis Farina) has another serial killer on his hands, the Tooth Fairy (so called from the bite marks he leaves on his victims), and asks Graham to come back into action. There is a time factor involved, since the killer is on a lunar cycle with his killings. Graham's unusual modus operandi is to get deeply into the minds of the killers, a place so horrible in Lecktor's case that he's not really recovered. In order to get the scent again, Graham pays a brief visit to Lecktor (Brian Cox) in the asylum, much as does Clarice Starling in Silence of the Lambs. However, here the relationship is far more personal since the antagonists already know each other far too well. In the mix are Freddie Lounds (Stephen Lang), an obnoxious photographer for a tabloid, the Tattler, and the blind girl Reba (Joan Allen) who manages to get into the heart of the Tooth Fairy, Francis Dollarhyde (Tom Noonan), thereby making herself a target. Mann (who also wrote the screenplay) unfortunately seems to have been determined to turn this film into a routine police procedural; nearly everything of interest or edgy is left on the cutting room floor. Lecktor has nothing to do, really; indeed, his cannibalism is not so much as mentioned in the picture. Graham's mind-melding with the killers is reduced to talking to himself and we don't get the agony of identification which come through so clearly in Harris' book. Most importantly, almost all of the red dragon imagery of the original is eradicated, other than a brief glimpse of William Blake's painting which is the focus of Dollarhyde's obsession. Although on several occasions there is reference to his becoming something else, what that goal might be is left mystifyingly blank. Noonan gives an incredibly chilling performance as Dollarhyde, as frightening a character as you'd ever want to meet. Cox is quietly threatening as well as Lecktor; it's a shame he doesn't get more screen time. Kim Greist (previously seen in Brazil) is Graham's wife Molly, and although her part was cut down she still does a good job of carrying off the conflicted nature of her relationship with Will. She is both protective of him and more than a little frightened of him and the way he works. Petersen seems to be sleepwalking through the part; on numerous occasions his lines just do not ring quite right, and Dennis Farina is quite wooden as Jack Crawford. Mann had been producing Miami Vice for some years when he made this film, and the production design carries over, dating the movie badly. Nearly every shot has turquoise, pink or lime coloring in it, and Graham has the same semi-shaven look that Don Johnson wore for many years. It doesn't help that most of the men wear white ties on dark shirts. Mann does manage to instill significant suspense into a number of scenes, most notably the scene in which Molly spots shadows moving outside of the window of her house, and in the climactic scene which will make you look at In-a-Gadda-da-Vida in a whole different way. While there are a number of drawbacks, this is still a worthwhile picture that offers decent entertainment value. Image Transfer Review: The theatrical cut is presented in a sharp and clear anamorphic transfer. There are very good blacks and rich shadow detail is visible in the rich royal blues of the night. When Graham climbs a tree, there is some compression artifacting visible in the bark, but otherwise this is an excellent transfer. Much of the visual impression depends on texture, and it comes through wonderfully here, from the toilet-paper note from Dollarhyde to Lecktor, to the marble of the columns at the FBI office, to the cool smoothness of the antiseptic white cell of Lecktor. The Miami Vice color scheme comes through loud and clear. The video bit rate is a healthy 7+ Mbps. Audio Transfer Review: The 5.1 track has some wonderful atmospheric background noises in the surrounds which add palpably to the tension of the film. These are best when Graham visits the crime scenes and Lecktor's cell. On other occasions, there is some surprisingly clumsy directionality which spoils the moment, such as the sound of a wastebasket being moved in the left main. The 2.0 Dolby Surround track is quite nearly as good; both give excellent presence and natural-sounding dialogue. There is precious little LFE activity here. Extras Review: There are two extras included in the limited edition which are not in the single disc edition of the theatrical cut. The first of these is a set of production notes and photos which are cleverly packaged in a miniature manila file representing the case file, including what purport to be Will Graham's notes on the murders. The second and primary reason one might have for buying the limited edition is the second disc, which contains only the director's cut of the film. This is a highly disappointing extra on a number of counts. First off, it is presented in a nonanamorphic, badly-cropped 1.85:1 print which literally looks like sub-VHS quality throughout. On a large screen it is unwatchable. Artifacts abound, and there is a thick haze of grain. Blacks are lacking, as is any kind of detail. Edges are soft and smeary and colors are unexceptional. This is one ugly transfer. It's not helped any that it's presented single layer, keeping the bit rates down around 3 Mbps, although the source is so bad that this is probably a minor issue. More to the point, the differences in content are quite minor. This is apparently most of the extended cut which airs on Showtime and The Movie Channel, although its running time is a little over a minute shorter than the running time for that cut reported by Tim Lucas in his article on the film in Video Watchdog 13. There is some additional interaction between Will and Molly that helps flesh out their relationship. Also added is a brief scene between Will and Dr. Chilton in which Chilton warns about the necessary precautions in dealing with Lecktor, much like the similar scene in Silence of the Lambs, though a good deal more abbreviated. Finally, there is a brief coda where Graham visits the home of the Tooth Fairy's next intended victims, though it is presented in such a cryptic way that on first viewing it's hard to tell what's going on. The added footage includes nothing more of Lecktor or Dollarhyde, nor any additional gore from the crime scenes. In a companion article in Video Watchdog 13, there was coverage of cut scenes which greatly fleshed out the red dragon aspect of the story, including chilling shots of a red dragon tattoo which covers Dollarhyde's chest. No remnant of this remains in either cut presented here, although it is featured prominently in both the cover art and in the photos which accompany the limited edition. Blake's painting was given more attention, and the desire of Dollarhyde to become the dragon was far more explicit in this cut. That visual would have given so much more depth to Dollarhyde's unveiling for Lounds: "Well, here.....I am." Instead, he's just a guy with a stocking over his head, wearing a blue and white polyester shirt in the director's cut as well as the theatrical cut. When Anchor Bay announced this disc numerous fans of the film wrote requesting that this material be reinstated (as did this reviewer), but alas no such event occurred. Instead, we got this halfhearted attempt at a second cut which could have been handled by seamless branching on the first disc. The main disc includes an anamorphic trailer presented in 2.35:1 which looks quite good, biographies and filmographies for Mann, Petersen, Cox and Noonan, and the typically useless THX Optimode calibration materials. A featurette (10m:43s) on the cinematography is presented, and is quite interesting. A modern-day documentary (17:11) featuring interviews with Noonan, Cox and Allen is less useful, being peppered with too much talk about how wonderful it was to work with Mann (odd in light of Mann's reputation for being completely impossible). The supplements don't really add much in the end result. A somewhat flawed predecessor to Silence of the Lambs, presented in a very nice transfer. Don't bother with the 2-disc limited edition version; the director's cut is practically unwatchable and adds very little of value to the film.